"Lined up behind the space bartender..."
Born to Canadian parents in San Diego, California, in 1948, Heather McHugh was raised in Virginia and attended Harvard University. Her poetry delights and riddles, and is celebrated for its distinct approach to and idiosyncratic considerations of language. Richard Howard, in a 2000 review in which he appointed McHugh the great "sorceress" of her generation, writes that while "amateur clairvoyents (minor poets)" despair that language will never be as definitive as they wish, "the real right witch is elated by just this approximative 'predicament'; her poetry never defines (which means putting an end to something), only—only!—identifies." 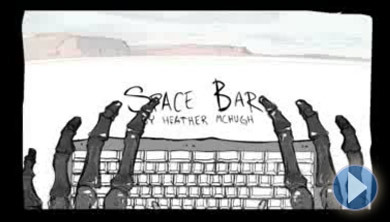 McHugh packs the short poem "Space Bar" full of her gleeful word maneuvers, allowing the poem to simultaneously address typography and dreamscape. Of the poem she has said, "My space bar turns out poems: makes space to live in." Her many honors include a Lila Wallace/Readers' Digest Award and one of the first United States Artists awards. Since 1984 she has served as the Milliman Writer-in-Residence at the University of Washington in Seattle. This animation was created by Braulio Garcia, and McHugh reads. To read this and other poems by Heather McHugh, as well as biographical information about the poet, please visit the Poetry Foundation Web site.